Confession: I am a barbecue virgin. Though I've done my fair share of grilling things in little foil packets (technically steaming, not grilling), not once have I ever thrown a slab of meat on the grill and watched it sizzle away. Part of this is due to a general aversion toward eating red meat, but to be honest, the grill is a little terrifying and intimidating. I can stick my bare hand in an oven set on broil and add half a bottle of wine to a hot pan without wincing, but even thinking about lighting charcoal or switching on the propane sends me into spasms of fear. However, I also won't back down from a challenge. Labor Day is here, and no matter how afraid one might be of drizzling lighter fluid on coals, one must use a real barbecue rather than cheating by using a stovetop grill pan or an ever-reliable George Foreman grill. Labor Day is for cookouts—out being a key part of that word. Cookouts, by definition, must be conducted outdoors on a real grill. Labor Day is also complicated by its timing at the very end of the outdoor cooking season. Hot dogs and hamburgers have pretty much run their course by this point, sausage has become boring and even kabobs are somewhat passe. My easier options—grilling training wheels, if you will—are effectively eliminated. What's a barbecue virgin to do? The obvious—turn to a guy with infinitely more experience. Editor and fellow foodie Greg Foley came to my rescue with a recipe for grilled pork tenderloin, which he claimed was easy enough for anyone to make. I had my doubts. I had more confidence when it came to the sides. Vegetables are definitely in my wheelhouse. As a former vegetarian, I have done just about everything imaginable to every green thing imaginable, and grilling was not going to be a problem. Deciding what vegetable to grill was another story. Peppers, corn, onions and mushrooms leaped to mind, but those are all kabob staples and likely any seasoned grillmaster is sick of them by now. Again, I turned to Greg. "What about asparagus?" I asked doubtfully. "Could that work?" With one word—"awesome"—he convinced me that I was on the right track. One side does not a dinner make, though. I needed another trick up my sleeve for this barbecue to live up to my expectations. In desperation, I did what many virgins before me have done and sought the advice of a much wiser woman. First, Arts and Living Editor Jen Liebrum terrified me with a story about how the last time she did a barbecue, her grill flared up and she lost her eyebrows. Second, though, she suggested a recipe for grilled rosemary potato salad. Throwing potatoes on the grill instead of boiling is not only faster, it gives the potatoes a deeper, more summery flavor than they might otherwise have. Toss the hot potatoes with a balsamic-rosemary dressing like the one below, and your perfect barbecue is rounded off nicely. Knowing what to expect is key to making sure that your first time goes off without a hitch. Keep in mind that the pork will take longer to cook than the asparagus, and the potatoes will take somewhere between the two. Don't be intimidated by the sheer amount of meat you're going to have to handle; trust me, it will all work out. If the first time isn't so great, don't worry, that's normal—sometimes it just takes a while to work out all the kinks. - Up to five hours and at least 40 minutes ahead: Marinate tenderloin. - Half an hour ahead: Heat grill and do all the chopping for the potato salad. - 20 minutes ahead: Remove tenderloin from marinade and place on grill. Skewer potatoes. 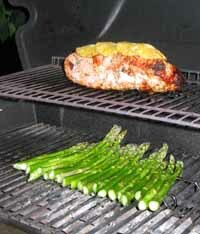 - 15 minutes ahead: Begin grilling potatoes, toss and skewer asparagus. Check on tenderloin, flip if necessary. Strain and boil marinade. - 10 minutes ahead: Flip potatoes, toss asparagus on the grill. - Five minutes ahead: Take tenderloin off grill and let rest. Meanwhile, remove potatoes from grill and complete salad. Remove asparagus from grill, de-skewer and serve. Everyone has his or her own method for tenderloin, but a few things remain constant: Use a good marinade, make sure a thermometer inserted in the center registers 145 degrees and let it rest for a few minutes when it's done. To marinate, place up to two pounds of meat in a one-gallon resealable plastic bag with 1/2 cup soy sauce, 1/2 cup white wine, 4 chopped green onions, 3 cloves of chopped garlic, 1 tablespoon of fresh grated ginger, and 1/2 tsp. ground black pepper. Grill over medium-high heat until the center reaches 145 degrees, or when the tenderloin is firm but still pink (about 15 minutes). Meanwhile, strain and boil remaining marinade for five minutes. When the tenderloin is done, remove from heat, brush with the boiled marinade, and let rest for at least 3 minutes. This is the easiest dish in the entire world as long as you remember to skewer the asparagus on two sticks, so they kind of look like little rafts. That makes the veggies much easier to flip, and saves you from dropping the stalks onto the coals or coils. Toss 1 pound of asparagus with 3 tablespoons of olive oil and salt and pepper to taste. Skewer as directed above, then toss the whole thing on the grill for 3 to 6 minutes (depending on thickness and crunch preference), flipping halfway through. Remove from skewers and serve. Place potatoes in large bowl and toss with about 3 tablespoons extra-virgin olive oil, 2 tablespoons grill seasoning and rosemary. Skewer and grill potatoes 4 to 5 minutes on each side. Toss potatoes with onions, vinegar, and remaining olive oil while still warm. Add the arugula to the potatoes and toss to distribute just before serving.